Originally designed for Special Forces, where size, weight and extreme ease of use are paramount. The SAVE is a rugged, lightweight, hands free ventilator design specifically to meet the challenges of the tactical environment. 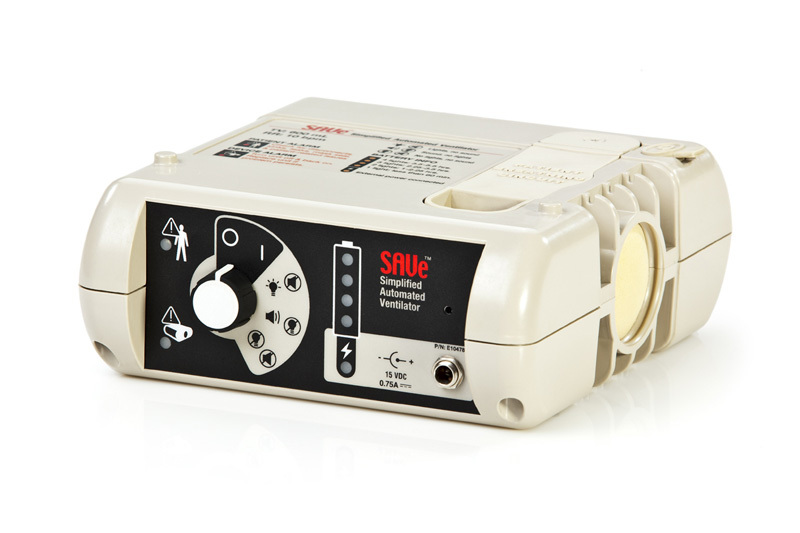 The SAVE delivers an AHA compliant tidal volume (600mL) at a fixed respiratory rate (10 bpm) which removes any guesswork and reduces operator error. The ventilator is completely self-contained, weighs only 1.3 kg and does not require a compressed gas source. It can be used with a mask or a secure airway. Low pressure supplemental oxygen can be used if desired. The SAVE will deliver ambient air for up to 5.5 hours on a single battery charge and may be recharged from a standard AC outlet. It is a set flow, time cycled, pressure limited (38 cmH2O) device. Forward deployed field medics, mass casualty incident coordinators within the Department of Homeland Security and EMS professionals will find the device well suited to their needs.